Sridhar Varadarajan | OK Listen! Sridhar Varadarajan is a composer and musician that writes and composes music in his tiny room even though he has access to a slightly larger studio. These songs sometimes are held captive for a long time being, re-written,re-arranged,re-recorded,re-mixed till they finally make their escape and see the light of day for the first time in their long lives. 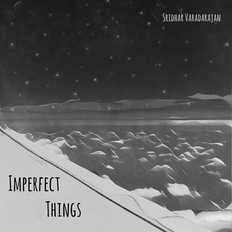 'Imperfect Things' is Sridhar's first release featuring collaborations from the likes of Dr. Prakash Sontakke, Kishan Baalaji (Bhoomi, Galeej Gurus), Praveen Biligiri (Bhoomi, Peepal Tree), Arjun MPN (Pineapple Express, Brodha V) on the songs 'Snowfall' and 'Taller Than The Trees'. The EP is a collection of songs written over the course of a year or more including fresh melodies that feature in songs that took a couple of days from start to finish to some that changed shape over the course of more than a year.